Before the beginning of any battle the soldiers always cried out the shrilling slogans (mottos). Why they did these slogans (mottos)? They did these slogans (mottos) in order to motivate and encourage among themselves. These slogans (mottos) gave them tremendous energies, strengths and powers to march ahead in their battle. They charged up and boast up their hidden potentials; and then they defeated their fierce enemies in the battle field heroically . Similarly, in the battle of life you need the shrilling slogans (mottos) in order to rise up your slumbering valour. These slogans (mottos) awake you and bestow you energy, strength and power to achieve your goals of life. You always see the raising balloons in the open sky. Do you know why these balloons raise up in the air? This is because they are filled with hot air, and the hot air always helps the balloons to rise up in the air. In the same way, you need strong motivations and encouragements to rise up in your life. ‘THE MOTTOS OF LIFE’ is a book of motivations and encouragements that help and guides you to achieve your goals of life. Live in your new world…. Always keep your mottos of life in order to motivate and encourage yourself. * This book teaches you lessons of love. * This book teaches you how to get happiness in your life. * This book teaches you the meaning of labour. * This book teaches you the importance of discipline. * This book teaches you the importance of responsibility. * This book teaches you the significance of your good character. * This book teaches you the true meaning of loyalty. * This book teaches you the power of truthfulness. * This book teaches you to grow your courage in your life. 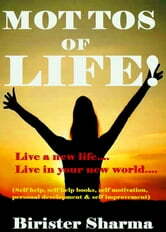 * This book helps you to gain your self-believe. You can’t live your life without love. Love is a breath of your life. Love is like oxygen of your life. In every moment you need love. Your life is only with love. Your world is only with love. If there is no love; there is no life; and there is no world. A family can’t survive without love. Many hearts break ups due to lack of love. Many relations break ups due to lack of love. It is only love that can heal the broken hearts. It is only love that can mend the broken relations. It is only love that can unite the broken families. The foundation of every happy family is love. Without love no relation could ever last. To live a happy life, it is very important to love each other. Love brings unity in the family. It is a thread that keeps intact the entire family. Livres similaires à Mottos of Life! 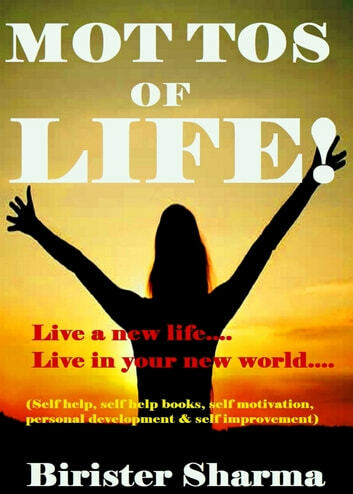 (Live a new life…..Live in your new world….Gives you a new resolution in your life)...Helps you to realize your love,happiness,work,discipline,responsibility,courage,self-believe & determination. How I Created My Perfect Mate...and Married the Man of my Dreams!